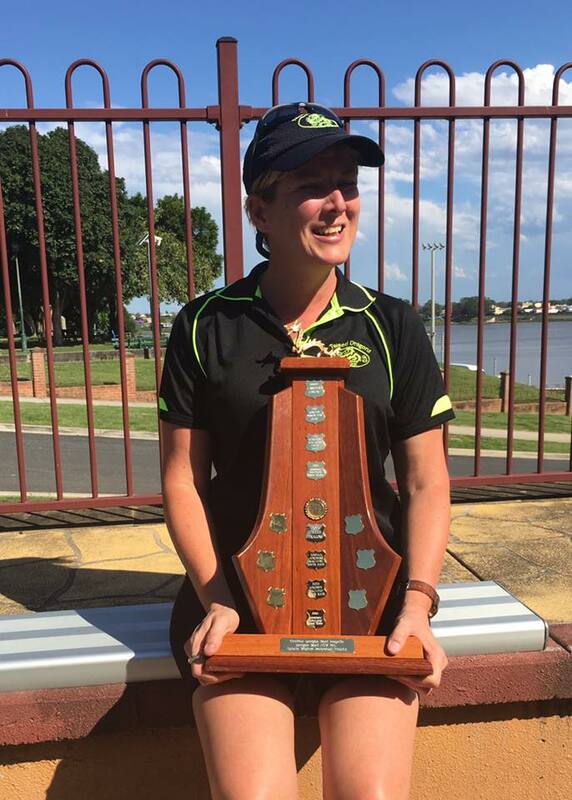 By winning 7 medals in total Tweed Dragons had the best ever year at the Queensland State titles held at Kawana Waters on 23/24 March 2019. 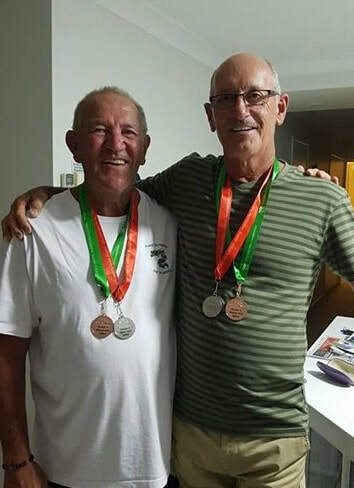 Mixed and open Senior C (over 60) crews won GOLD in 500 metres and 2km standard boat events, and SILVER in 200 metres open small boat event, also BRONZE in the 200 metres small boat mixed event. Open Senior B (over 50) crew won SILVER in the 500 metres standard boat event. Tweed Dragons are extremely grateful to our local State Member, Geoff Provest. Here are some photos of club members and Geoff after officially receiving the NSW Office of Sport grant. Tweed Dragons great inaugural result at worlds and now our juniors taking it to the highest level - Great work Kalani & Josh - just reward for your determination and commitment, great work also by parents Marg and Andrew for always being there for them. 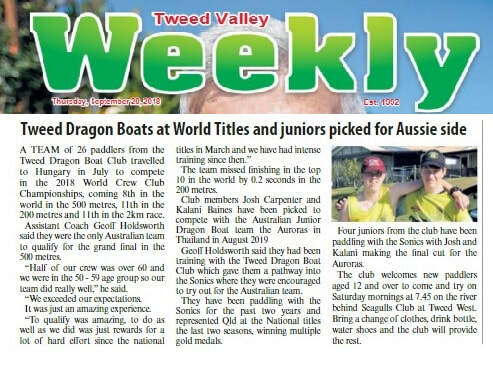 Tweed Dragons have represented Australia by competing in their inaugural Club Crew World Championship held in Szeged, Hungary 17 - 22 July 2018.This championship featured 30 countries, 160 clubs and over 6100 paddlers. 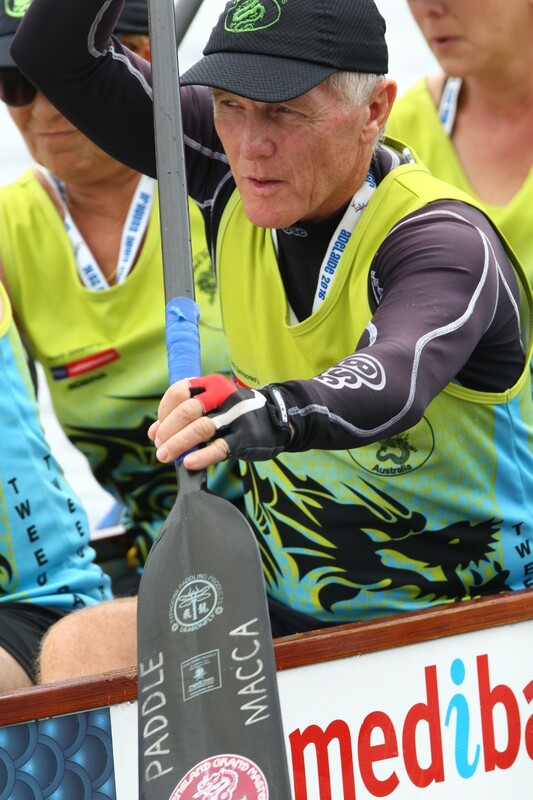 Tweed competed in the Senior B category which is for paddlers over 50 years of age, finishing 8th in the world over 500 metres and 11th in the world over 200 metres and over 2 km. A most credible result, especially when it is considered that over half of our crew were over 60 years, and one was over 70. Tweed Dragons, mixed minor final CCWC from Tweed Dragons on Vimeo. CCWC 500 metres Senior B mixed boat semi final from Tweed Dragons on Vimeo. CCWC Tweed Dragons, 2km mixed senior B, standard boat from Tweed Dragons on Vimeo. 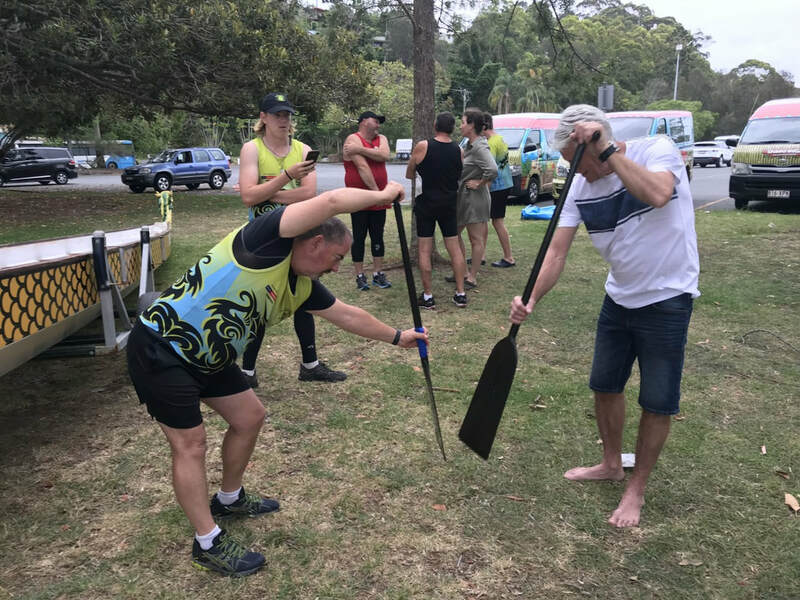 Tweed Dragons in 2018 Mullum2Bruns paddle. Tweed Dragons expand on their success at the Queensland State Titles with an outstanding achievement at the Australian National Championships held at Lake Kawana , Sunshine Coast 7/8 March 2018. 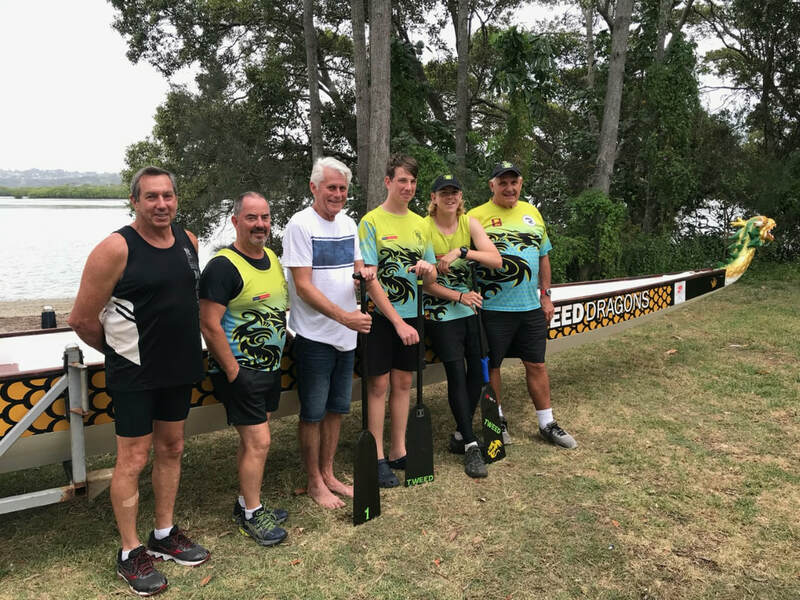 Tweed Dragons enjoyed previously unparalleled success in the 2018 Queensland State Dragon Boat Championships held at Lake Kawana, Sunshine Coast on the weekend of 17/18 February 2018. Tweed Dragons have qualified to represent Australia in the Senior B (over 50's) mixed standard boat category, in the Club Crew World Championships to be held in Szeged, Hungary in July 2018. Currently our club is undertaking various fund raising activities to help take our members to Hungary. The Seagulls Club have generously come on board to assist our fund raising where each Friday from 6.00 pm our members sell tickets at Seagulls for various prizes including meat trays, winners are drawn at 7.15 pm. Tweed Dragons extend our thanks to the management, staff and members of the Seagulls Club for your support each Friday, and we look forward to meeting you all again every Friday from 5.30 pm. Look out for our green dragon. 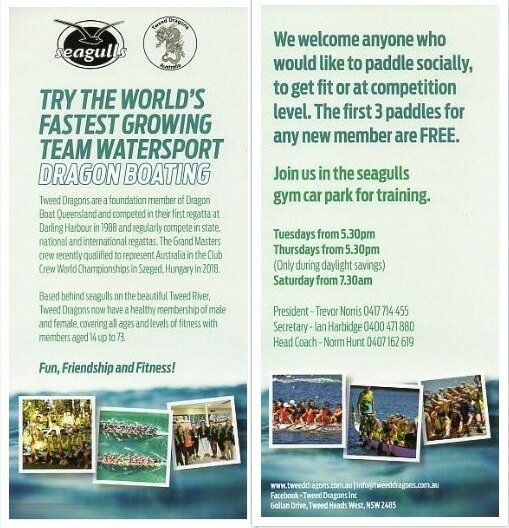 Until October 2018 Tweed Dragons train at Birds Bay, behind the Seagulls Club, each Tuesday at 5.30 pm and each Saturday at 8.00 am. Our training times change in October when daylight saving starts. We invite anyone that is interested to come and try our sport. Just come down and introduce yourself and we will be happy to take you out in the boat with us. 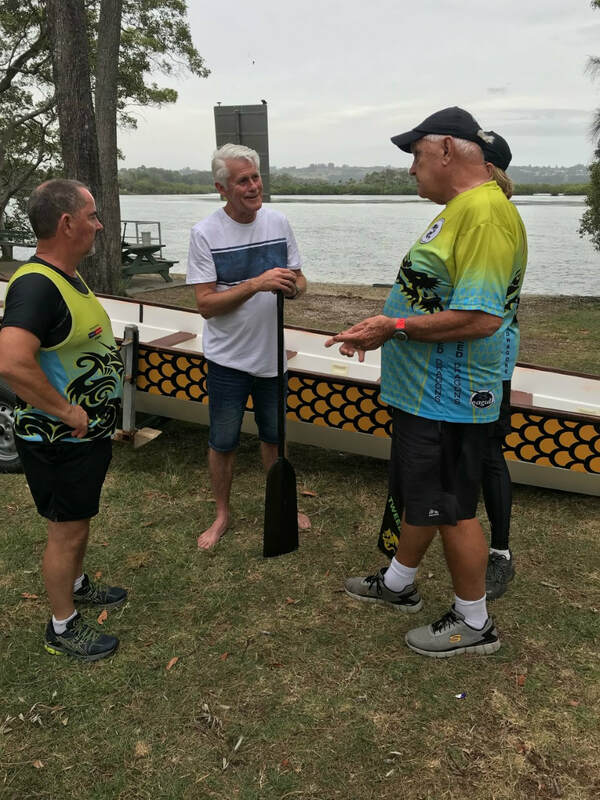 ​Tweed Dragons Inc., are a foundation member of Dragon Boats Queensland (DBQ) and provide an opportunity for Tweed and Gold Coast residents to get together competitively and socially through a challenging and exhilarating team sport.